Flying in the mountains takes specialized procedures and techniques. Safety demands that you have the facts and knowledge. This pocket guide provides you the information you need to know to keep you out of harm's way. 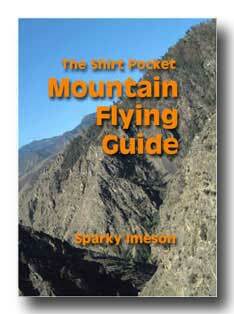 This book is not a rehash of the Mountain Flying Bible Revised. It includes new material and color photos throughout; 129 pages are color. Book dimensions: 3.5" x 5.25" x 0.35"